This virtual appliance contains one Linux server as shown below. 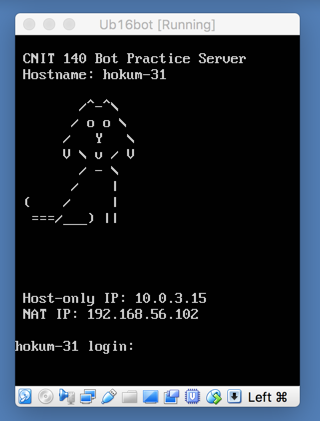 You can SSH into it at the "NAT IP" with the username student and a password of student. Note these facts, as shown below. The purpose of this project is to deny the attackers control of your server, while continuing to provide service to real users, using only a firewall. Ubuntu includes "ufw" -- the Uncomplicated Firewall. On your server, via SSH, execute this command to see your firewall status. The firewall becomes active, as shown below. Refresh the scoring webpage. After a minute or so, it should change, as shown below. Ports 80 and 81 are now filtered, but your box is still PWNED, because you have not filtered outgoing traffic. This blocks beacons, but also prevents PING and DNS requests from the server, as shown below. It also lets SYNs come in on unused ports, such as port 81, which will allow bind shells. Write up a brief report describing what you did, and present it at the end of class. Add the best solutions to your Blue Team Guide for competitions.